Today, Lt. Governor Anthony G. Brown was joined by President of the Maryland Board of Education Dr. Charlene Dukes, Baltimore County Superintendent of Schools Dr. Dallas Dance, other state and local officials, and early childhood education advocates for a press conference announcing $4.3 million in Prekindergarten Expansion Grants to 24 providers throughout the state. The grant program is made possible by the O’Malley-Brown Administration’s Prekindergarten Expansion Act of 2014 (SB 332), which Lt. Governor Brown led the effort to pass during this year’s legislative session. Under the expansion, the State is partnering with local providers and schools systems across the state to expand high-quality full and half day pre-K to another 1,563 children. 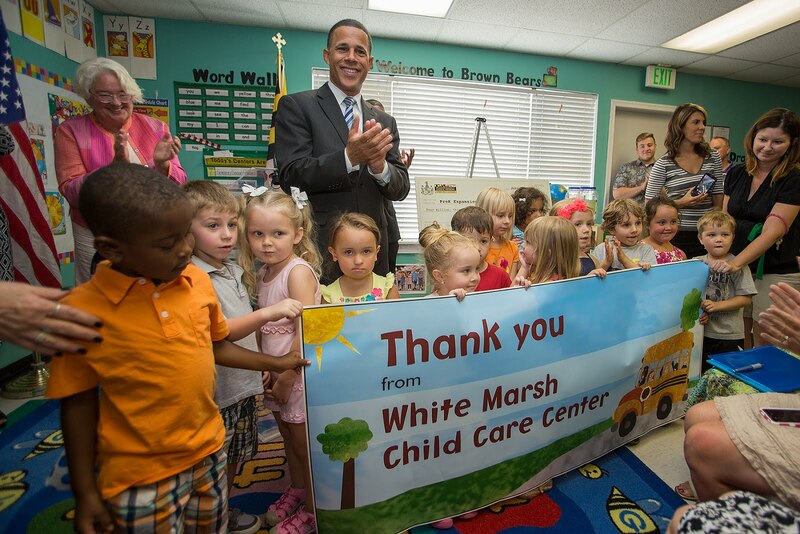 Today’s announcement took place at White Marsh Child Care Center (WMCCC), one of five programs in Baltimore County that are receiving a total of $770,000 in funds to expand their services under the grant program. WMCCC will receive $112,000 to support an additional 20 four year old children. The Center also plans to use these funds towards teacher salaries and technology upgrades in the classroom (including computers) in order to reach families in need of educational services. "Baltimore County has been, and continues to be a leader in early childhood education, and this $770,000 in State funding for pre-kindergarten expansion recognizes our ongoing commitment and will make a real difference in our communities,” said County Executive Kevin Kamenetz. “I want to thank Governor O'Malley and Lieutenant Governor Brown for their commitment to education in Baltimore County." The Prekindergarten Expansion Act of 2014 (SB 332) builds on the State’s existing pre-K system and expands the number of pre-K slots available to include Maryland children whose families make up to 300 percent of the Federal Poverty Guidelines. The bill represents the first step toward expanding pre-K to all Maryland children by establishing a competitive Pre-Kindergarten Expansion Grant Program and Fund through which local school systems and local providers were able apply to establish, expand and enhance existing pre-K programs and highly effective Judy Centers. Recipients were selected by the Maryland State Department of Education (MSDE) following the application process which began in April. See attached for a full list of recipients. “This Prekindergarten Expansion Grant builds upon the existing public prekindergarten system and moves us even closer to the target goal of providing universal access to high-quality prekindergarten for Maryland children of all income levels,” said Dr. Lillian M. Lowery, State Superintendent of Schools. A unique partnership in Baltimore City between the State and Baltimore Commmunity Foundation, sponsored by the Ravens and M&T Bank, that will allow for a new Judy Hoyer Center to open at Arundel Elementary School in Baltimore City. "High quality pre-k plays a critical role in preparing Maryland's children for success. This initial expansion is part of a larger effort to one day provide pre-k to all Maryland children. We want to thank Lt. Governor Brown for his leadership and partnership in this important effort," said State Senator Nancy King who, along with State Senator Bill Ferguson, was a leading supporter of this legislation in the Senate. "Today's pre-K announcement is an important step forward for Maryland children and families," said House Ways and Means Chairman Sheila Hixson. "Providing our children with high quality pre-k helps prepare them for a lifetime of learning, engages families in their children's education and reduces long-term costs to government.” Other leading pre-K expansion advocates in the House included Delegate Anne Kaiser and Delegate Sandy Rosenberg. In order to encourage partnership with the private sector and local and national foundations, the grant program allows businesses and philanthropic entities to contribute funds to support the expansion, which will be matched by MSDE.In addition to the $4.3 million in State funding announced today, the Baltimore Community Foundation (BCF) has established an agreement with MSDE and Baltimore City Public Schools to fund the opening of a new Judy Center at Arundel Elementary/Middle School in the Cherry Hill neighborhood of Baltimore City. BCF's contribution, sponsored by the Ravens and M&T Bank, is $165,000 per year for three years which represents 50% of the operating costs for a Judy Center. The remaining $165,000 is covered by MSDE. After three years, MSDE will assume total operating costs for the Judy Center. Despite making more cuts to state spending than any previous administration, Governor O'Malley and Lt. Governor Brown have chosen to protect targeted investments in priorities like education and job creation. The FY2015 budget builds on Maryland’s #1 school ranking and paves the way to global competitiveness for our children. It includes a record $6.12 billion investment in K-12 education, which is an increase of 37 percent compared to FY2007. In addition to the $4.3 million for additional Pre-K opportunities, the Administration will invest $289 for the Public School Construction Program, bringing the O’Malley-Brown Administration’s average annual investment to the highest ever at $345 million.